It’s time for more discounts on some top PS4, PS3 and PS Vita games. Get up to 50% off a great lineup of titles starting right now. If you think you might pick one (or two, or three, or four) of the games on sale, act fast, because this Flash Sale ends at 6:00PM Pacific on Friday, January 31st. 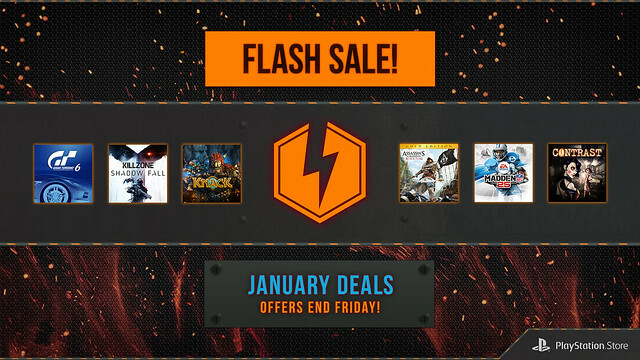 From Killzone Shadow Fall and Knack on PS4, to Gran Turismo 6 and Assassin’s Creed IV Black Flag on PS3, to Injustice: Gods Among Us Ultimate Edition on PS Vita, the January Flash Sale is stocked with plenty of exciting games with some great discounts. Let us know what games you’re going to grab in the comments below. The Flash Sale starts now and ends Friday at 6:00PM Pacific. Not really interested in most of them since I already own most of them! Good price for Super Motherload though. pretty good game in m opinion. I am guessing the next thing we will hear about this week is the ps plus update for February. Woot! Looks good! We’ll be chatting about PSN goodness on the Go For Rainbow podcast. If you didn’t pick contrast for PS4 this is a good chance to get it. Its a unique game on its own. Wow…. way to leave things so late. Probably already knew most of us already own these already right? Can’t even call this a sale as these games (with the exception of the PSN only titles) are cheaper on disc in store. Save your money folks! I am not even going to buy a PSN Cash Card until they have a sale on Tomb Raider PSOne Classic Games. And I will make another request for you to add Tomb Raider CHRONICLES to the store !!! This really is a flash sale–a complete surprise and only good for a couple days. Nothing for me but thanks, anyway. Nothing for me. Bought AC4, Killzone, and Knack all at launch. Waiting on good deals for NFS: Rivals and Lego Marvel. Love these flash sales, PlayStation! Keep it up. Would have been nice to see a sale on a AC IV PS4 game. No interest in the rest. I don’t know how this works, but I’ve bought Black Flag digital code in amazon for 29,99 quite some time ago. And that’s to redeem in the psn! So I don’t get this is a sale. And it seems to me that the lack of content are making the sales lame, since there’s no competition. Either we buy this or we don’t buy anything. Meh. Meh for me but I’ve got so much to play right now that I’m not too worried about it. Not bad prices though. LOL Fifa 13, why not Fifa 14? I wish there was a sale on the jurassic park game. Telltale folks, come on, give it a price drop already. 19,99 is a steep price for it, nowadays. Or make it a TT bundle. If you cant enjoy anything like me dont saying the sale is a lame one, you just been selfish. How can Amazon beat your prices on the physical copy of YOUR games? Please have a VITA JRPG SALE, PLEASE!! Injustice: Gods Among Us Ultimate Edition (PS Vita)	At $20.99 I still have to think about it, if it was $15 or less I would just buy it with no hesitation. So far I can just wait a little more. For a flash sale (which lasts for only 2 days), these discounts should be a bit more generous. Where is the PS+ love? Nice sale, I’ll be getting PS3 & PS4 games. Would have been nice if Injustice was Cross Buy tho. Prices are listed as “Free” on the items, but when you click on them they show up at $41.99. When I try to check out it sends me to XMB or locks up. Someone (Sony) might want to check this out. Hmm. Already own the ones I COULD want from this sale. Contrast is definitely something people should buy, if you missed it as a PS+ member for the PS4! Black Flag is $29.99 on amazon both physical and digital code…..why is the sale price $41.99 here? Mistake maybe? Thank you for doing another flash sales, even if I don’t want or already own most of it, it’s still a good thing you do these bonus sales. So…….wheres the Playstation Plus preview for February? I’m hearing Assassins Creed 3 is gonna be free according to EU users. Would be awesome of AC4 Season Pass was on sale! @45 please no, AC3 is awful. I would love to see tomb rider, sly or metro on the list. Also what EU gets is completely different from what we get.